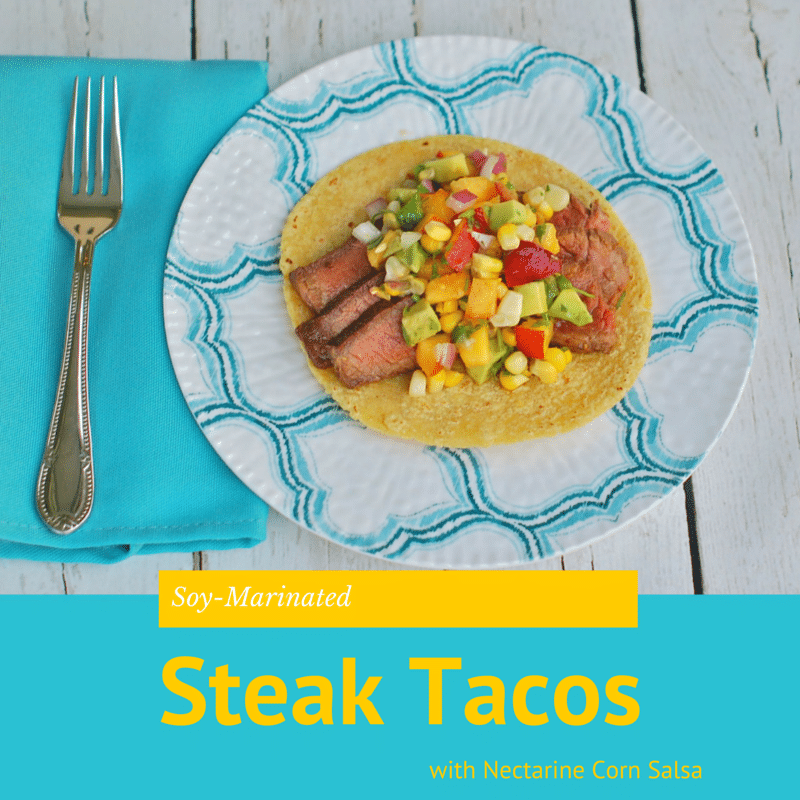 Enjoy the nutrition and health benefits of lean beef with these juicy soy-marinated steak tacos topped with a colorful and nutritious nectarine corn salsa brimming with the flavors of summer. If you follow my weekly menu plans you’ll see we have beef for dinner at least once every week or two. A beef-eating registered dietitian nutritionist may seem contrary to everything you have thought about nutrition, but that’s where you’d be wrong. And that’s why I share my menu plans, my recipes, and the science of nutrition – to show and inspire everyday people who are working hard to make healthy choices that all foods can fit into a balanced, nutritious diet. And let’s not forget the delicious part too. A 3-ounce serving of lean beef provides 25 grams of protein and 10 essential nutrients, including iron, vitamin B12, and zinc. Research shows that consumption of high-quality protein (like beef) within calorie goals supports a healthy metabolism and assists with weight loss and maintenance of a healthy weight. Benefits of eating protein include feeling satisfied after a protein-packed meal (which helps reduce mindless eating), building muscle and reducing body fat. 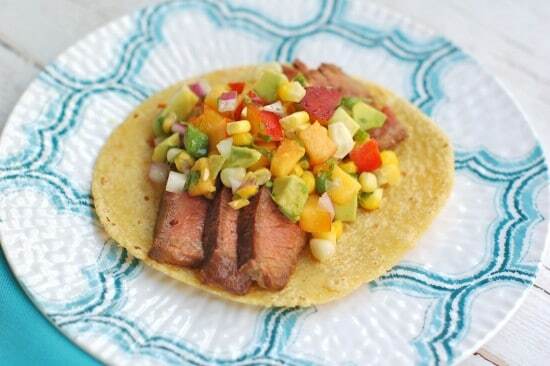 You can see there are many great reasons to enjoy lean beef, and today I have another one: these juicy steak tacos made with flank steak (also sold as london broil) and topped with a nectarine corn salsa that is bursting with flavor, color, and all the goodness of summer! 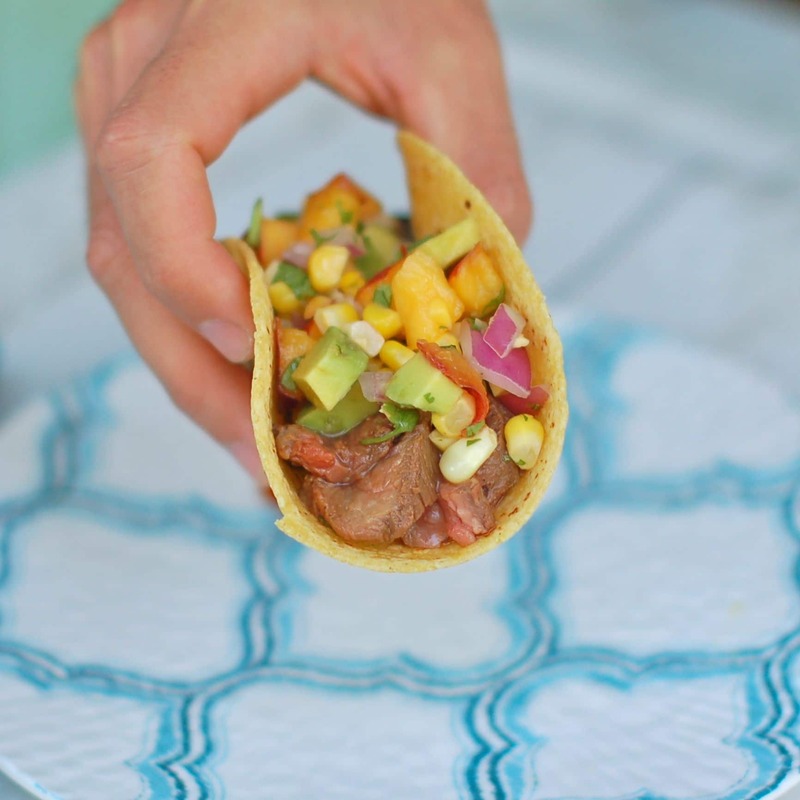 Enjoy the nutrition and health benefits of lean beef with this juicy soy-marinated steak taco topped with a colorful and nutritious nectarine corn salsa brimming with the flavors of summer. In a measuring cup or medium bowl, whisk together all the marinade ingredients (soy sauce through garlic). Place steak in a resealable plastic bag and pour marinade over it. Refrigerate for at least 30 minutes and no longer than 24 hours. In a medium bowl, toss all salsa ingredients together. Cover and refrigerate for about 30 minutes so flavors meld. 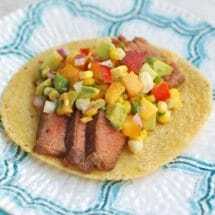 To serve tacos, lay about 3 slices of steak in the middle of a corn tortilla. Spoon salsa over steak, fold over and enjoy! 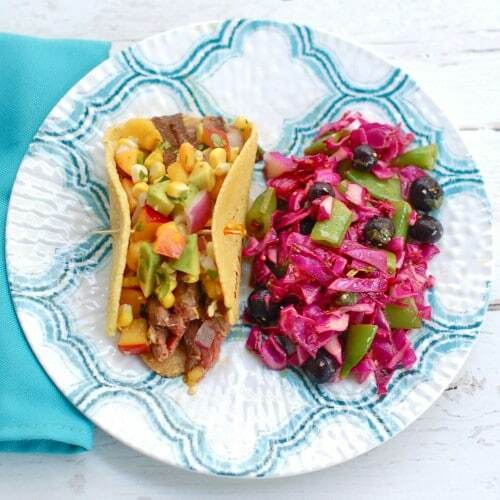 I served these steak tacos with my Red Cabbage, Snap Pea, & Blueberry Salad. What a meal it was! Looking for more lean beef recipes? Check out the other contest entries below from fellow ReDuxers! Do you have a go-to beef recipe? What a creative recipe! I’ve never tried nectarine in a salsa, but am imagining it would be as good as pineapple! Thanks alisa! I highly recommend it! I can’t over the awesomeness of flavors going on in this dish! ohh tacos sound fabulous for tonight and I love the topping!! Oh it is so good! Hope you try it! The steak looks absolutely perfect and I’m totally in love with that gorgeous salsa! Good luck Jessica! Thank you so much Sonali!! Thanks Janice! Happy Cinco de Mayo!